Last year, I got a bright idea. 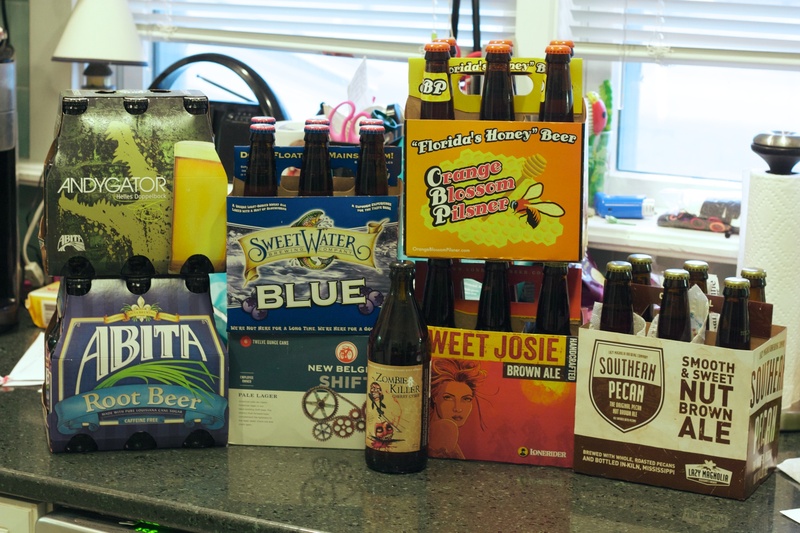 The In-Laws were spending a month in Myrtle Beach and I thought maybe, just maybe, I could get them to bring some beer home for me. As a result, I got my hands on some R.J. Rocker’s Son of a Peach, New South Brewing White Ale and Sweetwater Blue, in addition to a sixer of Shiner White Hare Pale Ale. They made a fatal mistake, though. They told me that they “had fun” hunting for the beer and that it gave them something to do on one of the rainy days that kept them off the beach. Fun? This is fun? Heh heh. Now, rewind a couple of years. Before Shiner made its debut in Upstate America, I was hooked solidly on Shiner Bock. In need of a fix, I sent The Aunt out shopping while she was visiting friends in Bethany Beach, Md. She said that it gave her something to do on a rainy day and that she thought it was fun to walk in the stores and run the staff around looking for beer. She said that an old lady looking for beer is not something that they often see. Another one who finds this stuff fun. Seriously, who goes on extended vacations and finds shopping for beer for their relatives fun? I’m not trying to bite the hand that feeds me, but I’m confused nonetheless. The In-Laws returned today from four weeks in South Carolina and The Aunt is back from five weeks in Sarasota, Fla. Each received extended shopping lists, knowing that inventory and seasonal deliveries would limit them. The Aunt went to Total Wines & Spirits, a megachain of stores with a location in Sarasota. The In-Laws? They go to the place heralded for having the best craft beer selection in Myrtle Beach: Piggly Wiggly. Apparently, PW has gone big on it’s beer department in the area and developed quite a following. B. Nektar Meadery Zombie Killer: The bomber. I had this at the premiere party for World of Beer. It’s pretty awesome. It’s cider with honey and cherry. One day this spring, I’m going to sit on my back patio, enjoy the birds chirping and sip this. And I don’t think I’m going to share it with anyone. Abita Root Beer: Root beer has a pecking order. There is Abita, then there is Virgil’s, then there is Saranac. That’s it. Everything else might as well be Ramblin’. Sweetwater Blue: Blueberry beer, but not like Wild Blue or Watchusett. This actually tastes like blueberries. Very easy drinking. Just a pleasant spring/summertime beverage. New Belgium Shift: A pale lager with session beer qualities. Easy drinking and very clean. I really need New Belgium to distribute in New York. It seems like they are the last of the big regional brands that have yet to break in here. Lone Rider Sweet Josie Brown: This is one of two beers in the group that I haven’t tried before. It’s a Great American Beer Festival gold medal winner and with a 6.0% backbone. Lazy Magnolia Southern Pecan: I had this in New Orleans for the first time and I was hooked. Could not get enough of it. It’s a nut brown ale made with whole roasted pecans. This will be savored. Abita Andygator: The Helles doppelbock with an 8.0% spine that could flatten you. One of the best I’ve ever had. Orange Blossom Pilsner: It’s a pilsner made with honey. That’s all I know about it. That and it’s brewed in Orlando. I asked The Aunt for selections from Cigar City Brewing, but the store was sold out of everything. The espresso porter, the IPAs…everything. Strange. Now I must have it! The quest has begun. Had Andygator for the first time last year and at the brewery. It’s definitely a favorite, and defines beer should be enjoyed for its quality rather than quantity (although I would wrestle a few of them if I wasn’t driving anywhere). The root beer is quite delicious as well. I’ll definitely have to try the rest when I stumble upon them.